The Levelland, Texas UFO encounters case is, arguably, one of top 10 sighting events in modern ufology. It is also an example of the how the USAF & Project Blue Book attempted to cover up a UFO incident. On the evening of November 2, 1957, Patrolman A. J. Fowler, officer on duty at Levelland, Texas, received the first of several strangely similar phone calls. The first was from Pedro Saucedo, who, with companion Joe Salaz, had been driving four miles west of Levelland when a torpedo-shaped, brilliantly illuminated object rapidly approached the car. As the object passed close over the car, the truck headlights went out, and the engine died. Officer Fowler reported that a total of 15 phone calls were made to the police station in direct reference to the UFO. In 2011, UFO researcher Stan Friedman discusses the Levelland, Texas UFO incident on KTRH News Houston. Incident: For the moment, let us look at the probability that motors are killed and lights and radio stop by coincidence when the driver has a UFO close sighting. We have all seen cars stopped by the side of the road, hood up, waiting for tow trucks. It would be highly improbable that a car would become completely immobilized and then a few moments later “heal itself,” yet it can happen. Perhaps, for example, a wire that had become loose was jarred back into place in some way. But to combine this low probability event with the simultaneous appearance of a strange light coming down from the sky and hovering over the car, the car remaining disabled only so long as the light was present, is dubious at best. It is, of course, much the easier way out to dismiss the whole matter as “psychological” (whatever that means in this context) and return to commonplace, understandable matters. However, that would not be acting true to the high ideals of science, which involve being curious about all things that occur in man’s environment, investigating and weighing them, and calmly considering the evidence. If the probability of a happening in any one case is extremely low, consider the probability of coincidence in the following train of events – if they happened as reported. On the evening of November 2, 1957, at about 11:00 P. M., just one hour after the Russians had launched their second, dog-carrying artificial satellite (that certainly was coincidence) but before we Americans knew about it, Patrolman A. J. Fowler, officer on duty at Levelland, Texas (population 10,000), received the first of several strangely similar phone calls. To whom it may concern: on the date of November 2, 1957, I was traveling north and west on route 116, driving my truck. At about four miles out of Levelland, I saw a big flame, to my right front. . . . I thought it was lightning. But when this object had reach to my position it was different, because it put my truck motor out and lights. Then I stop, got out, and took a look, but it was so rapid and quite some heat that I had to hit the ground. It also had colors – yellow, white – and it looked like a torpedo, about 200 feet long, moving at about 600 to 800 miles an hour. As the UFO moved into the distance, the truck lights reportedly came on by themselves, and Saucedo found that his truck started easily. The two men drove on to Whiteface, ten miles west of Levelland, and it was from a phone booth there that the call was made to Officer Fowler. Fowler apparently figured the man must have had one too many drinks, and he dismissed the report from his mind. Considered by itself, the testimony of an uneducated, frightened truck driver, as sincere in his reporting as he might have been, has little credibility. But one hour later Fowler got another call, this time from Mr. W. of Whitharral. Fowler was told that he (Mr. W.) was driving four miles east of Levelland (the direction in which the Saucedo object had disappeared) when he came upon a brilliantly lit egg-shaped object, about 200 feet long, sitting in the middle of the road. As Mr. W. approached it, his car engine failed, and the headlights went out. According to the observer, the object was lit up like a large neon light and cast a bright glare over the entire area. The observer decided to get out of his car, but when he did so, the UFO rose and, at an altitude of about 200 feet, the object’s light or glare blinked out entirely. Mr. W. then had no trouble starting his car. A short time later Officer Fowler got another call, from another Whitharral man, who was, at the time of the incident, some 11 miles north of Levelland. He reported to the police station that he had come across a glowing object sitting on the road and that as he approached it – the reader can finish the sentence -his car engine stopped, and his headlights went out. But when the object left shortly thereafter, all was again well. But that was not the end. According to a signed statement in Project Blue Book files, at 12:05 A.M. that Saturday night in November, a 19-year-old freshman from Texas Tech, driving roughly 9 miles east of Levelland, found that his car engine began to sputter, the ammeter on the dash jumped to discharge then back to normal, and the motor “started cutting out like it was out of gas.” The car rolled to a stop; then the headlights dimmed and several seconds later went out. Baffled at the turn of events, he got out of his car and looked under the hood but found nothing wrong. Closing the hood, he turned away and then noticed for the first time, he reported, an oval-shaped object, flat on the bottom, sitting on the road ahead. He estimated it to be about 125 feet long, glowing with a bluish-green light. He stated that the object seemed to be made of an aluminum-like material, but no markings or other details were apparent. Frightened, he got back into the car and tried frantically but in vain to restart the car. Resigned, he sat and watched the object sitting in front of him on the road (he did not state how close he thought he was to the object) for several minutes, hoping that another car would drive by. None did. The UFO finally rose into the air, “almost straight up,” and disappeared “in a split instant.” Afterward, the car was again fully operable. At 12:15 A.M. Officer Fowler got still another call, this from a man phoning from a booth near Whitharral. This observer reported his encounter with the strange object at a point some nine miles north of Levelland. Once again the glowing object was sitting on a dirt road, and as his car approached it, its lights went out and its motor stopped. Soon the object rose vertically, very swiftly, and when it reached an altitude of about 300 feet, its lights went off and it disappeared from sight. As the reader expects by now, at this point the car lights came back on and the car was started with no difficulty. By this time Officer Fowler had finally realized that something odd was going on, and he notified the sheriff and his colleagues on duty, some of whom took to the roads to investigate. Two of them reported bright lights, seen for just a few seconds, but they did not have any car-stopping encounters. At 12:45 A.M. another single witness – I have broken my rule to use only multiple-witness cases because of the independent witnessing of essentially the same event or object, with the same physical effects, from independent nearby points – driving just west of Levelland and thus close to the spot where two hours earlier Saucedo had had his sighting, spotted what looked like a big orange ball of fire at a distance of more than a mile. The ball then came closer and landed softly on the highway about a quarter of a mile ahead of the observer. It covered the paved portion of the highway. The witness reported that the motor of the truck he was driving “conked out” and his headlights died. Meanwhile, the object sat there on the road ahead of him, glowing bright enough to light up the cab of his truck. In about a minute, the observer reported, it made a vertical ascent – and, of course, things returned to normal. This encounter was not phoned in at the time to Officer Fowler but was reported the following day. One possibly significant clue to some as yet unknown process may lie in the fact that the reporter stated that when the UFO landed it changed from its original red-orange color to a bluish green but that when it rose it changed back to red-orange. And it is perhaps of interest to note at the object or objects always landed on the pavement, except once, when it settled on a dirt road. But that is not all. At 1:15 A. M. Officer Fowler got another call, this time from a terrified truck driver from Waco, Texas, who was at the time just northeast of Levelland, on the “Oklahoma flat road.” The man told Fowler that his engine and headlights suddenly failed as he approached within 200 feet of a brilliant, glowing egg-shaped object. He said that it glowed intermittently ‘like a neon sign” and that he estimated it to be about 200 feet long. He reported that as he got out of the truck, the UFO quickly shot straight up with a roar and streaked away. Officer Fowler stated that the truck driver was extremely excited when he called and that the witness was most upset by his close encounter. The truck engine and lights worked perfectly when the object left. miles from Levelland, the two men spotted an oval-shaped light, “looking like a brilliant red sunset across the highway,” a good 300 or 400 yards south of their patrol car. “It lit up the whole pavement in front of us for about two seconds,” said Clem. Was driving south on the unmarked roadway known as the Oklahoma Flat Highway and was attempting to search for an unidentified object reported to the Levelland Police Department. · . . I saw a strange-looking flash, which looked to be down the roadway approximately a mile to a mile and a half. . . . The flash went from east to west and appeared to be close to the ground. None of these patrolmen’s cars was affected, but Levelland Fire Marshal Ray Jones, who also was looking for the UFO, stated that his car’s headlights dimmed and his engine sputtered but did not die, just as he spotted a “streak of light” north of the Oklahoma Flat. In terms of probabilities, that all seven cases of separate car disablement and subsequent rapid, automatic recovery after the passage of the strange illuminated craft, occurring within about two hours, could be attributed to coincidence is out of the statistical universe – if the reports are truly independent (and they are, according to the tests we’ve used throughout). Suppose we try to attribute the happening to mass hysteria, although that does not disclose a mechanism for killing engines and extinguishing lights and stopping radios. The observers were independent unless all of them, for example, were listening to a local radio station that carried the news. (No investigator ever checked into the important question of whether the radio stations were notified and if they broadcast the reports.) We know that at first Officer Fowler discounted the reports, and it is unlikely that he would have almost immediately notified the local station. But let us suppose that he or someone else did and that all car radios were tuned in to that particular station. We still would need an explanation for the physical effects reported unless we attribute them to downright prevarication rather than to hysteria. What was needed at the time was swift reaction by Blue Book and a serious, thorough investigation. Captain Gregory, then head of Blue Book, did call me by phone, but at that time, as the person directly responsible for the tracking of the new Russian satellite, I was on a virtual around-the-clock duty and was unable to give it any attention whatever. I am not proud today that I hastily concurred in Captain Gregory’s evaluation as “ball lightning” on the basis of information that an electrical storm had been in progress in the Levelland area at the time. That was shown not to be the case. Observers reported overcast and mist but no lightning. Besides, had I given it any thought whatever, I would soon have recognized the absence of any evidence that ball lightning can stop cars and put out headlights. I was told that the Blue Book investigation consisted of the appearance of one man in civilian clothes at the sheriff’s office at about 11:45 A.M. On November 5; he made two auto excursions during the day and then told Sheriff Clem that he was finished. A newspaper reporter subsequently said that he had recognized the investigator and identified him as an Air Force sergeant. Interfering with cars on the highways is but one of the physical effects reported in this category of Close Encounters. There are also the reported – and photographable – effects on living things, notably plants and trees. Many witnesses have reported temporary paralysis in their limbs when their encounters have been quite close. At 10:55 pm a married couple driving northeast of Levelland reported that they saw a bright flash of light moving across the sky and their headlights and radio died for three seconds. Five minutes later Jose Alvarez met the strange object sitting on the road 11 miles (18 km) north of Levelland, and his vehicle’s engine died until the object departed. At 12:05 am (November 3), a Texas Tech college student named Newell Wright was surprised when, driving 10 miles (16 km) east of Levelland, his car suddenly died. When he got out to check on the problem, he saw a “100-foot-long” egg-shaped object sitting in the road. It took off, and his engine started running again. At 12:15 am Officer Fowler received another call, this time from a farmer named Frank Williams who claimed the egg-shaped object’s blue glow pulsated, and each time it glowed brightly, his engine died. Other callers were Ronald Martin at 12:45 am and James Long at 1:15 am. On November 2, 1957 – Levelland, Texas – This night would be the most unforgettable experience ever for patrolman A. J. Fowler, who was manning the police call line. He received fifteen different calls from anxious citizens reporting UFOs. The sightings began at 11:00 PM, some four miles west of town. Pedro Saucedo and friend Joe Salaz were driving in a pick-up truck, and observed a brightly lit cigar-shaped object heading in their direction. Pedro’s truck began to fail, the engine cut out, and the electrical system went dead. The truck was allowed to roll to a stop. Pedro and his friend recalled the unknown object as being 200 feet long. In the small town of Whiteface, he called in what he had seen to Fowler, who thinking he was talking to a drunk person, dismissed the call. At 11:45 PM, Fowler gets his second call of the night. Near the small town of Whitharral, located four miles east of Levelland, a man encountered an egg-shaped object, this time the object was sitting in the middle of the road. The object was brightly lit. The man left his vehicle, watching the object from a safe distance. Shortly, the UFO slowly raised from the ground to an altitude of about 200 feet, and disappeared. His vehicle had also stalled, but restarted after the UFO was gone. At 12:00 AM, the third call of the night comes in. A man traveling about 11 miles north of Levelland sees a UFO sitting on the road. His vehicle is disabled. He sits for a time watching the unknown craft. Before long, the silent object lifts up, and disappears into the night. The man’s car immediately fires up again. He drives to the nearest telephone, and calls in his report. At 12:10 A.M, Texas Tech freshman Newell Wright was driving 9 miles east of Levelland when his engine failed. The nineteen-year-old got out of his car, popped open the hood, and tried to see if he had an electrical problem. He then saw an unknown object landed on the pavement a small piece down the road. He estimated the object’s length at 125 feet. It was a bluish-green color. It soon rose up and disappeared. Only five minutes later, at 12:15 AM, another driver near Whitharral, encountered an unknown object in the middle of the highway. His vehicle also was disabled. Like the other drivers, after the object left, his vehicle returned to normal. After a fourth call reporting a landed object in the middle of the road, patrolman Fowler began to worry, and called patrol cars in the Levelland area to be on the look out for this object. At 12:45 AM, Fowler received yet another report from the general area of Saucedo’s initial sighting. This time the driver sees an orange ball-like object coming toward him. He reported that the UFO made a soft, quiet landing on the pavement of the road. He also related a strange phenomena-the orange color of the object changed to a bluish-green color as it landed on the highway. He could also estimate the length of the object at about 18 feet, as it covered the entire width of the road. There would be about a 30 minute lapse in the reports with the next one coming in at 1:15 AM. A truck driver from the city of Waco, Texas, made the call. He tells Fowler that driving northeast of Levelland, he saw a large unknown object which glowed in the dark sky. The man sounded frightened on the phone. The trucker noted that the object was about 200 feet long, which agreed with the initial Saucedo report. The man’s truck, temporarily disabled by the object, roared back to life when the object left his area. Up until 1:30 AM, all of the reports received by Fowler had been from civilians. That would change when he received a report from two lawmen, about 3-4 miles out of Levelland. Sheriff Clem and Deputy McCullough testified that they observed a “large, glowing object,” pass across the highway in front of them. The had never seen anything quite like it. They had been monitoring Fowler’s reports on the positions of the callers, and tracking the object. The officers stated that the entire highway was lit up below the sun-like object. For reasons that we will never know, for some 2 1/2 hours on the night of November 2, 1957, the city of Levelland, Texas was visited by unknown flying objects that landed on the roads of the city and surrounding areas. Patrolman Fowler logged fifteen calls from concerned, and sometimes frightened callers. What exactly were the UFOs that landed in or near Levelland? Certainly, a full investigation was needed. The day after the sightings, the entire city was full of newspaper reporters, and other interested parties. The United States Air Force did eventually arrive in Levelland, but only did a brief overview of the case. They theorized that “ball lightning” could be the cause of the sightings. Naturally, we know that ball lightning does not land on highways, and disrupt car engines. The case of the Levelland, Texas, landings is still unsolved. 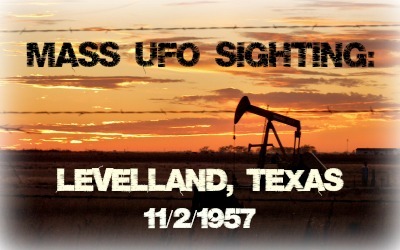 In 1957, between the late evening hours of November 2 and the early morning hours of the 3rd, seven independent witnesses near Levelland, Texas saw an oval shaped ball of light approach their vehicles causing their engines to stop and headlights to shut. The sightings took place in a 2.5 hour period (from 10:50 PM until 1:15 AM) and was limited to a 10 mile radius area West, North and East of Levelland. The events lasted from a few seconds to no more than 5 minutes. Once the ball of light left the scene, all witnesses were able to start their automobile engines and their headlights went back to normal operation. Most witnesses were scared about the incident and eventually called the Levelland Police Department to report the incident. While descriptions of the sighting varied amongst all witnesses, there was a general consensus that some lighted object was stopping cars and trucks around Levelland. On the early morning of November 3, there were other witnesses who saw lights in night sky and flashes of light. While these sightings added to the confusion and emotion of the evening, they will not be considered in this study. The Levelland Sightings are defined in this study as only those seven reports where a bright ball of light was within 500 feet of the witness’ vehicle and led to engine and headlights failure. On November 4, 1957, the incident at Levelland was reported in most of the newspapers across the US. Newspapers were dumbfounded as to the nature of the mysterious ball of light and gave it different names: mysterious object/thing, flying egg, whatnick, and eggnick. Many newspapers quoted Representative J.T. Rutherford from Odessa, Texas who wanted to know whether the sightings were the result of an American experiment and sent a telegram to Air Force officials in Washington asking for answers. It was not until Nov. 5, 1957, that the idea that an extraterrestrial craft caused the Levelland sightings gained publicity in the newspapers. Most of the newspaper quoted James A. Lee (a NICAP member from Abilene, TX) as the key proponent of this idea. On Nov. 15, 1957, the Air Force issued a summary report concluding that the incident was a rare form of lighting called ball lightning. The Air Force solution to this puzzling case was so controversial that the Air Force had to discuss the case in a US Congressional briefing on the UFO program on July 15, 1960 . While the case was solved as far as Blue Book was concerned, for many UFO organizations (NICAP, APRO, CSI) the case was not closed but instead represented one of the best-documented cases of a UFO.